If you boil down all the different ways we can help our clients as Rehab and Return to Work Professionals, it comes down to one ultimate goal: help that person get back to work. Receiving a referral for job seeking support (i.e. help this client secure a new job) is commonplace. In fact, it’s one of the core competencies that we, as rehabilitation counsellors, are required to develop as part of our profession. So if job seeking and placement is one of the core tenets of the rehab process, and if job seeking skills are something that all rehab professionals are required to develop as part of their training… why is it being done so poorly? And why are the results so underwhelming? Time and time again, I have conversations with insurers who have the expectation that rehabilitation providers should be the experts in helping people secure a job. Insurers expect that when they ask for “job seeking support and assistance”, that the rehab professional will know what to do, and they will help their client achieve that result. Yet time and again, insurers have expressed their frustration to me that all of the money they’ve spent on rehab to help their client secure a job has been wasted. I graduated with a degree in Rehabilitation Counseling in 1994. I remember the core competency checklists then – and when I compare them to the skills that we are asking our new graduates to develop today, more than 20 years later – they have barely changed. The truth is that Rehabilitation Counselors do not receive robust training in the job seeking and placement process, and the training that is provided is severely outdated. I know this because I have supervised new graduates who are confused and uncertain about how to take the theory they have learned and apply it to a real person and a real job. If you’re working with an allied health professional within a rehab provider, such as an Occupational Therapist, or a Physio, or an EP – it’s highly likely that they haven’t undergone ANY training in job seeking and placement as part of their formal education – and if they have, they’ve either received it on the job or sought it out themselves. So we have a new generation of Rehab Professionals who either haven’t received much training in job placement at all – and if they have, it was for a labour market that no longer exists. The labour market is different now. Industry has changed. And the way that we source jobs in 2017 barely resembles what it was like to look for work in 1994. 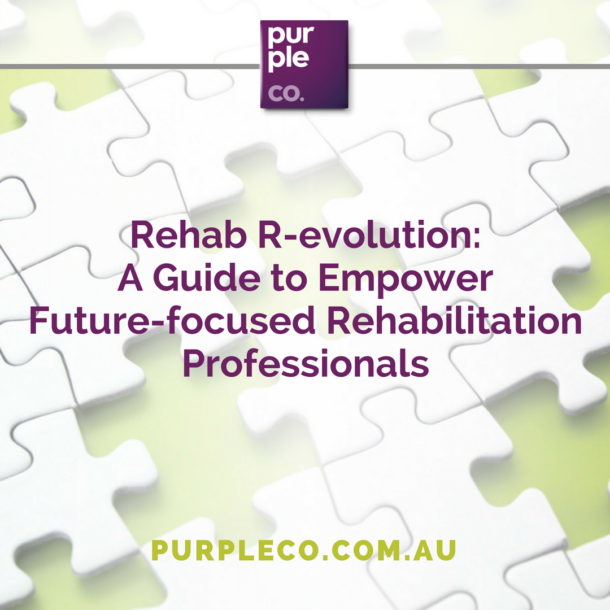 Another concerning issue is that more experienced Rehab Professionals aren’t investing in the ongoing learning, training and skills development that is necessary to keep up with a changing labour market and recruitment landscape. They may be experts in certain conditions or treatment protocols, but finding a Rehab Professional who is fully across the labour market of TODAY is like trying to find a unicorn. So we have an issue in our profession – there is a mismatch between what insurers and referrers expect of rehab, and the skills and knowledge required to fulfil those expectations. The result is that rehab is seen as ineffective, as a cost drain, and as something that “doesn’t work”. On the other side of the equation, we have a lot of assumptions happening between insurers and rehab. Insurers expect that rehab will know what to do when a “job seeking” referral comes through, and so a lot of what is needed is lost in communication and left unsaid. I’ve also noticed a one-size-fits-all approach to job seeking. Insurers will often ask us to start the process by reviewing someone’s resume – without having taken the time to ask whether reviewing someone’s resume is actually the best way to help that person get that particular job. Rehab Professionals are guilty of this as well. There is a lack of critical thinking and creativity that seeps into the job seeking process, and it’s affecting our outcomes. It seems obvious to point out that obtaining work in the media industry is very different to obtaining work as a labourer, which is very different to obtaining a role in government. But it is so rare that the people involved in this process – the client, the provider, the insurer, the treating health professional – will take the time to slow down and think critically about whether following the process we’re used to following will actually get us the results we want. The question we need to ask is… what is the best way to help this person get this job – not just any job but this job. Too often, we fall into the trap of following the same process, and using the same tactics for each client that comes our way, regardless of their unique circumstances and the nature of the work we’re helping them pursue. And so again – rehab is seen as something that doesn’t work, and something that is too expensive, and a waste of time. Finally, we have a misconception among clients that rehab providers are like wizards who have a magical bucket of jobs at their disposal, ready to hand out at a moment’s notice. I can’t count how many times a client has expressed to me, in as many words, “it’s your job to get me a job”. Is it any wonder that we’re struggling so much with helping our clients get back to work? A lack of formal training. Outdated approaches to job seeking. Processes that quash critical thinking. Is it any wonder that we’re all feeling annoyed, frustrated and disillusioned? Each party involved in the job seeking process has a role to play here. We are all responsible, but no one is to blame. Rehab professionals MUST begin upskilling and learning more about the modern labour market, and become diligent about maintaining those skills. Everyone must become better at expressing their expectations of each other in this process. Critical thinking is something that we need to embrace before jumping into process and “how it’s always been done”. Sometimes, the process gets in the way of achieving the outcome we want, which kinda defeats the point of a process in the first place. We must help clients understand that they can’t show up to this process and expect to be handed a job. That’s not how it works in the real world, and it’s not how rehab works either. Those are just a few of my insights into what we can do to bring job seeking out of the dark ages and into the 21st century. I would love to hear your thoughts – please join the conversation in the comments below and share your experiences, comments and thoughts about what we can do to make the job seeking and placement process a worthwhile investment for everyone involved.